The solar cells is also called as Photovoltaic ( PV) cell and has a p-n junction with large light sensitive area for converting light energy into electrical energy through the Photovoltaic mechanism. 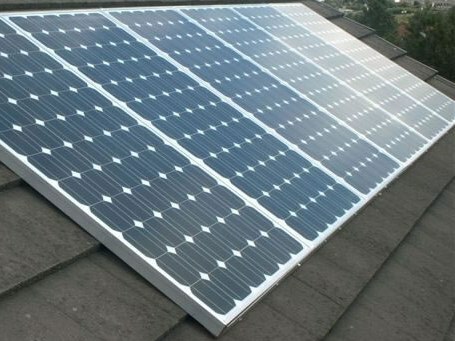 The solar panel consists of large number of Solar cells connected with serial and parallel connections. To increase the efficiency of the system, large number of solar cells are connected together and enclosed in a weather proof transparent case. This forms a Solar module. 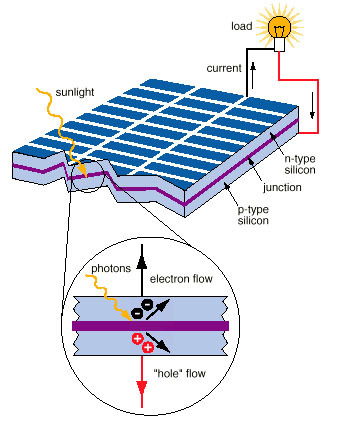 To get desired voltage and current, series and parallel connections are used between the solar cells. Series connection increases voltage while parallel connection increases current. A single solar cell is rated 1.5 volts. If a piece of p-type silicon is placed in intimate contact with a piece of n-type silicon, then a diffusion of electrons occurs from the region of high electron concentration (n material) into the region of low electron concentration (p material). When the electrons diffuse across the p-n junction, they recombine with holes on the p-type side. The diffusion of carriers does not happen indefinitely, however, because charges build up on either side of the junction and create an electric field. The electric field creates a diode that promotes charge flow, known as drift current that opposes and eventually balances out the diffusion of electron and holes. This region where electrons and holes have diffused across the junction is called the depletion region because it no longer contains any mobile charge carriers. It is also known as the space charge region. When no light falls on the solar cell, it behaves like a diode. As the intensity of light increases, current flow from the device increases. The open circuit voltage of a solar panel is more than its rated voltage. For example a 12 volt panel gives around 20 volts DC in bright light. But this decreases to 12-14 volts when connected to the battery. Ohmic metal-semiconductor contacts are made to both the n-type and p-type sides of the solar cell, and the electrodes connected to an external load. Electrons that are created on the n-type side, or have been collected by the junction and swept onto the n-type side, may travel through the wire, power the load, and continue through the wire until they reach the p-type semiconductor-metal contact. Here, they recombine with a hole that was either created as an electron-hole pair on the p-type side of the solar cell, or a hole that was swept across the junction from the n-type side after being created there. One of the serious problems is solar based battery charging is that, the battery will not get sufficiently charged in low light conditions like rainy or cloudy days. So it is necessary to monitor the charging process to prevent battery damage. Occasional charging with a battery charger will increase the life of the battery. 1. Performance from a solar panel will vary but in most cases guaranteed power output life expectancy is between 3 and 25 years. 2. Conditions such as an overcast sky, shadows, improper mounting angle, equatorial direction or short winter days will reduce the actual solar panel output to below the rated values. 3. Solar panels are rated in watts. As a rule of thumb a rating of 15 watts delivers about 1 amp per hour in direct sunlight. 4. Solar panels ratings are calculated in bright direct sunlight. Conditions such as indirect sunlight overcast and partial shade will decrease the output. 5. Periodic inspection to remove dirt, debris and check electrical connections is all that is needed. Keeping the panel clear of snow and debris will allow for better results. Next Fact File 2 – How does Electroluminescent Panel Works?